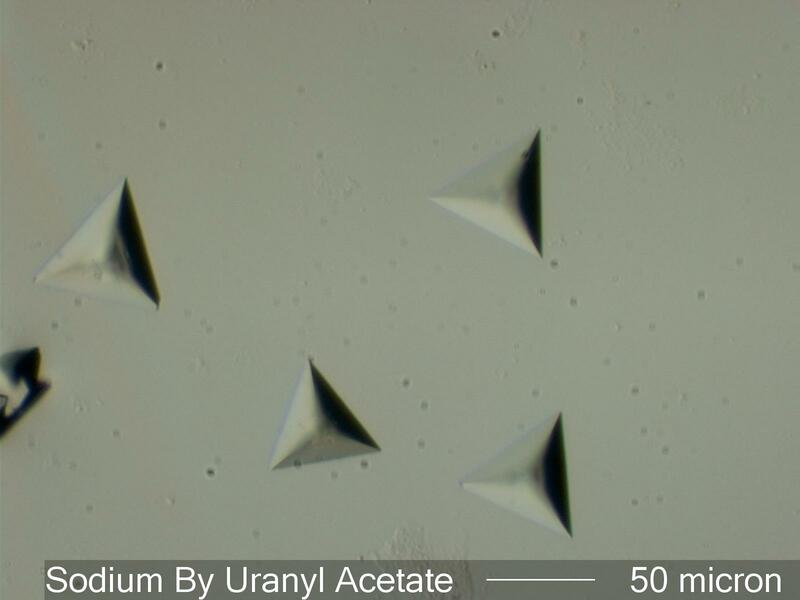 These tetrahedal crystals form if sodium is present in a powder added to a uranyl acetate solution. These are characteristic crystals of Na(C2H3O2)-A standard test for sodium is to test the dry salt with a solution of uranyl acetate (UO2(C2H3O2)-2H2O) in water made acid with a little acetic acid. If sodium ions are present well in excess of any divalent ions then these typical crystals are evident. If these crystals form then sodium is present. If these crystals don't form then sodium ions are not present or they are part of a complex crystal structure that may not be unique. Extraction of the interfering elements may be required. Sodium Uranyl acetate has a relatively high refractive index and so may appear black due to total internal reflection if illuminated with transmitted, centered Kholer illumination. Transmitted oblique illumination will allow some light to come through on one or two of the crystal faces. A number of other crystalline or non-crystalline phases may be present. A summary of the elements that may cause these other precipitates is given on page 57 and 58 of Chamot and Mason. Chamot, Emile Monnin and Clyde Walter Mason, HANDBOOK OF CHEMICAL MICROSCOPY, Volume II, pp. 51-58, 1940.